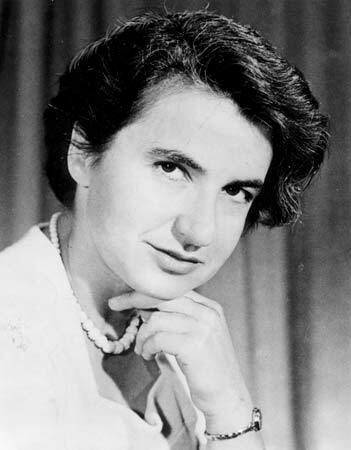 Rosalind Franklin’s 93rd birthday is today. Don’t know who she is? Well, you’re not alone. She is the unsung hero of DNA discovery. Franklin is best known for her work on the X-ray diffraction images of DNA which led to the discovery of the DNA double helix. Her data, according to Francis Crick, were “the data we actually used” to formulate Crick and Watson’s 1953 hypothesis regarding the structure of DNA. Franklin’s images of X-ray diffraction confirming the helical structure of DNA were shown to Watson without her approval or knowledge. This image and her accurate interpretation of the data provided valuable insight into the DNA structure, but Franklin’s scientific contributions to the discovery of the double helix are often overlooked. She may have been overlooked elsewhere, and particularly in terms of the Nobel prize awarded to Crick and Watson, but she has not been forgotten and was honored today by Google in a doodle! This entry was posted in Discovery, History and tagged General Information by Roberta Estes. Bookmark the permalink. It is about time she got the credit she deserves!!! I didn’t realize she is still alive. It would be wonderful if they modified the Nobel Peace Prize to include her. She isn’t. She died at age 37 of cancer. Such a loss. The Google (and others’) recognition is well deserved. However the Nobel Prize is only awarded to living people and sadly she had been dead for a few years when those others were awarded it for the DNA discoveries. So it is incorrect to say that she was overlooked or otherwise slighted regarding the Nobel Prize. I recognized this Google Doodle right away. I was recently at the Dolan DNA Learning Center in Cold Springs Harbor, NY and saw the exhibit all about her discoveries. Too bad she died too young. I was ecstatic when I saw the doodle! Rosalind Franklin is perhaps one of my favorite scientists of all time! Wish she could’ve had more time on earth. I have always wondered what we might have learned had she lived.